Often larger organisms are healthier and longer-lived than smaller specimens of the same kind. Certainly environmental factors (particularly nutrition) and genetic variations play an important role in determining a creature’s size and its lifespan. 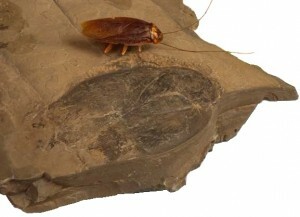 However, there are many creationists who believe that the larger ancestors of modern organisms (as seen in the fossil record) provide important evidence of decline in biological systems. Many years ago Henry Morris wrote, “[M]ost modern creatures are represented in the fossil record by larger and more highly developed individuals than their modern counterparts” (Morris, H, “The Power of Energy,” CRSQ, 1964, pp. 18-23.) The early earth would have provided the optimal environment for healthy organisms (with specialized original biomes created directly by God). Perhaps part of the explanation for gigantism was the atmospheric conditions of the pre-Flood world. But we know that some giant species persisted even in the centuries after the Flood (ice age megafauna, for example). Undoubtedly, biological kinds continued to decline as they do today. 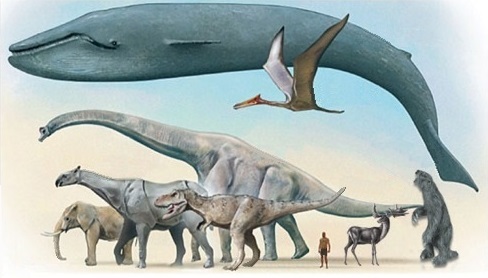 With some possible exceptions (like the blue whale and African Elephant) the fossilized remains of the various animal kinds are significantly larger than their modern-day counterparts demonstrating a general trend of devolution over time. But the dinosaurs were certainly not the only creatures that grew to fantastic size on the early earth. A similar reptile, the crocodilian Sarcosuchus Imperator, grew to over 40 feet in length. Notice on right the Sarcosuchus skull compared to a modern crocodile skull. Fossils found in what is now the desert of Niger tell of a hyper-crocodile that would have feasted on dinosaurs in what was then a verdant river valley. Oftentimes we can identify fossilized plants and animals as closely allied to still living species. For example, fossil ferns have been discovered that are in the same family as modern ones, but the fossil ferns are the size of trees! On the early earth, horsetails once shot up over thirty feet tall. A fossilized penguin named Anthropornis was found on Seymour Island off the coast of Antarctica (under New Zealand authority). 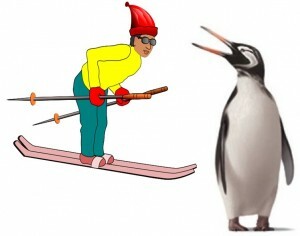 This is a genus of giant penguin that reached a height of about 6 ft and weighed about 200 pounds. By comparison, the largest modern penguin species, the emperor penguin, stands between 3 and 4 feet tall. There were huge cockroaches, ants, crickets, grasshoppers and even monstrous spiders that thrived in a land of endless summer. Dragonflies with nearly three foot wingspan skimmed over swamps in which eight-foot beavers, monster frogs, and sixty-foot cattails flourished. Beetles once grew to be the size of a baseball mitt and climbed up conifers that towered a hundred feet high. Australia’s iconic koala weighs as much as 31 pounds. Compare this to the ancient forest canopies where a 150 pound marsupial, called Nimbadon, ruled. 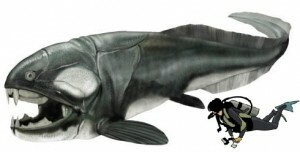 The fossil lungfish is twice the size of modern lungfish. Megapiranha, a fossil piranha discovered in Argentina was about 3 feet long–a beast four times as big as piranhas living today. Modern mayflies may sport a 10 inch wingspan at the most, but a primeval mayfly Bojophlebia prokopi had an 18 inch wingspan. A giant sand worm was discovered in Devon, England. 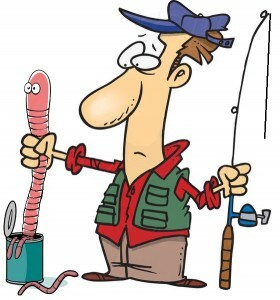 These giant worms would have grown up to 3 feet long and 6 inches wide. Their large burrowing holes indicate that the creatures would have traveled beneath the surface, not unlike the modern earthworms used for fishing. In his delightful book on fossil giants, Monumental Monsters, Vance Nelson demonstrates how creatures from all over the world have decline in size and diversity vs their ancient relatives. 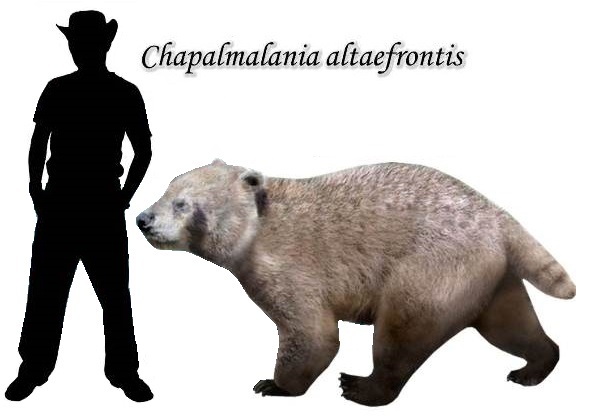 For example, the fossil raccoon Chapalmalania altaefrontis, (right) would have dwarfed living raccoons. With its short tail and 5-foot body, it would have looked a bit like a giant panda bear. Pelorovis is an extinct genus of African cattle that resembled the Cape Buffalo, but sported a 10 ft horn spread! To the upper left is pictured the skull of the giant hyena-like animal Dinocrocuta. This fossil monster would have weighed in at about 850 pounds, nearly 4 times the size of the largest modern hyenas. An unlikely fossil was discovered in 2009 in a Colombian coal mine…the largest snake on record. The monster, called Titanoboa, was about 45 feet long and would have weighed over a ton! By comparison, the Guinness record for a snake found alive is just over 25 feet. The Australian fossil Varanus prisca (aka Megalania prisca) demonstrates dramatic decrease in size of these monitor lizards (left). While the extant Komodo Dragon might reach 10 ft in length, its ancestral relative would have been about 26 ft long. 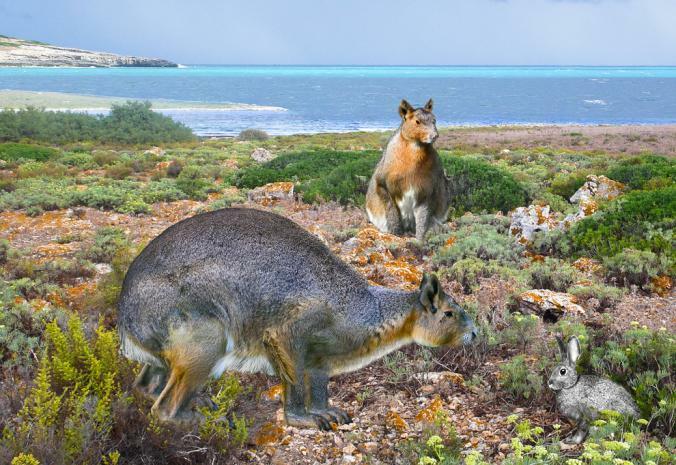 Wombat and seacow fossils similarly testify to giants in the past. Gigantism seems to be a major feature of the fossil record. 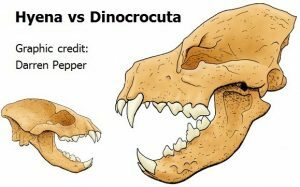 Fossil hunters in Uruguay uncovered the remains of a one ton rat creature (quite like the living South American Pacarana). 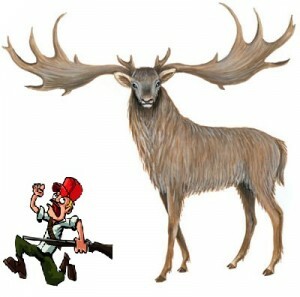 The rodent would have been roughly the size of a small automobile and its head alone would have been larger than a cow! 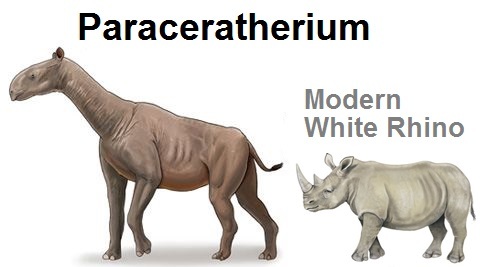 Another oversized rodent, the giant guinea pig, grew as big as a modern rhinoceros; while the ancient rhino grew to be the biggest mammal to ever walk on land. The large male white rhino might grow up to 4 tons, but the Paraceratherium, an extinct hornless rhino, grew up to 20 tons! 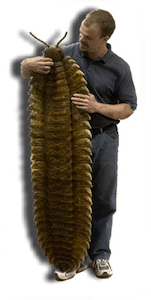 Tracks of an eight-foot-long monster millipede were discovered in New Mexico in 2005. Spencer Lucas, paleontology curator at the New Mexico Museum of Natural History, commented, “They just couldn’t survive at that size in modern air… For an insect to get that big, you’d need to have a lot more oxygen in the air.” (Quoted in Vorenberg, Sue, “This Bug’s a Big One,” Tribune Reporter, April 14, 2005.) Fossils of a 10 pound toad, a 13 ft high camel, a giant, bear-sized dog, and an 8 ft platypus all tell the story of larger organisms in the past. The ancient Steppe Mammoth weighed as much as 31,000 pounds in comparison to the largest elephant on record, a 24,000 pound bull that was killed in Angola. Modern coyotes are smaller than their Ice Age ancestors. The remains of a giant iguana were found in sediments on the Fijian island of Viti Levu. It is more than twice the size of the living iguana. The remains of giant baboons were discovered on the plains of Kenya. Weighing about 140 pounds, they would be twice the size of modern baboons. In ancient times the ferocious-looking, giant armored fish, Dinicthys terrelli, grew to approximately 30 feet long, with its head and neck covered in solid armor-like bone and sporting four scissor-like teeth at the front of its jaw. The fossilized remains of an ancient sea scorpion found in NY measures 6 ft in length. It seems like monstrous creatures existed in every ecosystem on the early earth! According to Guinness, the biggest hedgehog around today are the European hedgehog; and the largest on record is a porker that weighed just under 10 pounds. But the fossilized hedgehog Deinogalerix, which was discovered in Italy, was a huge hog that would have been 5 times the size of the European hedgehog. 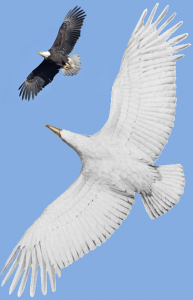 To the right is a comparison between a bald eagle and the giant Teratorn bird (Argentavis magnificens) with a wingspan of 25 ft ( comparison after Campbell, Kenneth E., “The World’s Largest Flying Bird,” Terra, Natural History Museum of Los Angeles County, 19:2, 1980.) The living bird with the largest wingspan is the wandering albatross, which has about 12 ft between wing tips. But the Pelagornis sandersi, an ancient albatross whose remains were found in South Carolina, had a 24 ft wingspan. 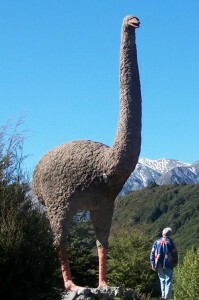 The extinct giant Moa (Dinornus maximus) from New Zealand stood an incredible 12ft tall (left). The South American seriemas are long-legged birds that forage on foot and prefer to run from danger rather than fly. They grow to about 35 inches in height. But the closely-related bird Brontis (whose fossils are found in South America) was a 900 pound “terror bird” who would have stood over 9 feet tall! Below are two of the fossils displayed at Mt. Blanco Fossil Museum: the skull of a giant salamander and horns of an ancient bison, measuring 8 foot tip-to-tip. 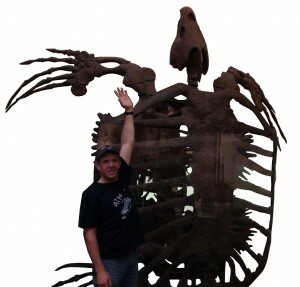 Also below is a huge turtle skeleton exhibited at Yale’s Peabody Museum. It is 11 feet long, 15 feet wide and would have weighed about 3 tons. Scientists in Spain found fossils of a mega-shrew that was capable of shooting venom out of blood-colored teeth. The researchers describe this extinct shrew, Dolinasorex glyphodon, as “giant” beacause it had a body mass of about 2 ounces, four times heavier than a modern water shrew. 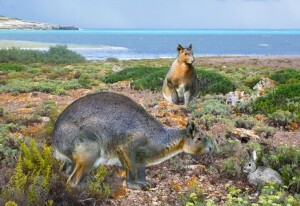 Massive deer, lemurs, kangaroo, and donkeys have all been found in the fossil record. Even an inch-long, Jurassic fossilized flea has been discovered that in China (bottom right). The Entelodont is an extinct creature that has been called the “Terminator Pig” because of its size and ferocious appearance. Looking something like a massively overgrown warthog, the Terminator Pig would have weighed over 900 pounds. But unlike today’s farm pigs that grow fat and lazy, the Entelodont would have been an apex predator. The picture to the right is of artist William Munns and his re-creation of the giant ape Gigantopithecus. Based on teeth and jaw fragments found in China, the great ape is thought to be 10-12 feet tall. 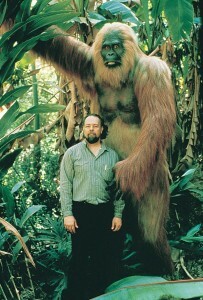 Some people believe something like this creature still exist in the form of Big Foot. 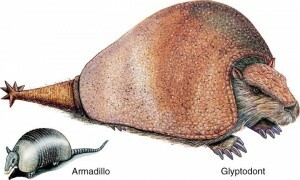 The giant South American armadillo grows to about 70 pounds. Compare this to the Glyptodont, the ancient South American armadillo that was as big as a automobile and weighed up to two tons! Then there is the example of the saber-toothed mesonyx. It was a wolf, somewhat larger than a Great Dane, and at least twice as large as a modern timber wolf. In 2017 an ancient wolf-sized otter species was unearthed in China. Siamogale melilutra is more than twice the size of the modern giant South American river otter. Discovered in 2011 on the Spanish island of Minorca were king-sized rabbit remains. The giant bunny weighed in at 26 pounds, about six times bigger than the common European rabbit (see the comparison to the left). The smilodon, a large saber-toothed tiger, was bigger and more ferocious than than any modern tiger. A giant short-faced bear skull found in South Dakota is one third bigger than today’s largest grizzly bears. Today it is rare to find a sloth that weighs 20 pounds, but the remains of the giant ground sloth Megatherium have been found in South American caves. It grew up to 4 tons and stood at 18 feet tall. So it didn’t need to climb trees to get plenty of leaves to eat. It seems that such gigantism was common among mammals even up through the Ice Age. The conventional picture of horse evolution from a small deer-like ancestor to today’s large horses needs to be reevaluated. The largest horse in recorded history, a Shire gelding named Mammoth, was born in 1848 and eventually weighed 3,300 lbs. But the fossil horse Equus Giganteus, a huge zebra-like animal, would have weighed well over 3,500 pounds, much more than any modern zebra! 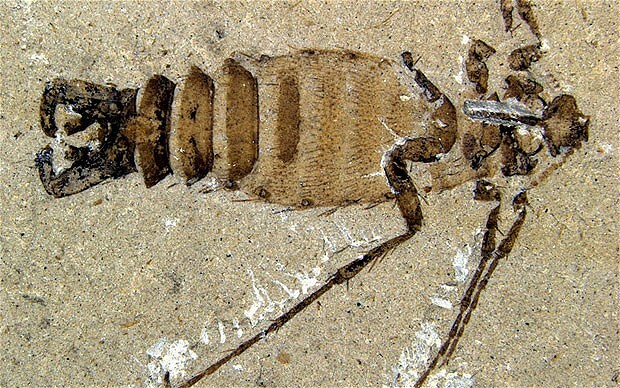 Fossil marine predators that resemble shrimp have been found in Morocco. But these ancient anomalocaridids were over 3 ft long. 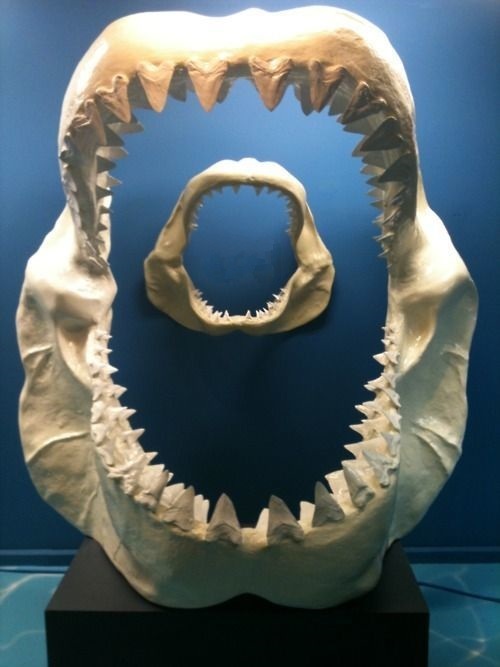 Perhaps the most terrifying of all the ancient monsters, the fossil shark megalodon grew to be thirty times as big as the largest reported modern great white shark. The fossil record is replete with examples of immense creatures that flourished in the past. That is not to say there aren’t also smaller varieties of these animals among the rock layers. Some preserved remains of beavers, rodents, elephants, and birds of prey would be close in size to their modern populations. There are even quite a number of smaller dinosaurs. Animal kinds throughout history seem to have enjoyed the capacity for a wide variation in sizes (like modern dogs). The point is that, when we can identify comparable kinds, there were considerably larger varieties, as a rule, in the distant past than we have alive anywhere today. And as far as we can tell, these are not outliers, freak cases of giantism. The norm of the population was simply larger in the past. With our current understanding of information theory, this large-scale trend of genetic entropy over the ages should not come as a surprise to us. Further evidence of biological decline comes from a California company, Ambergene, which has patented a process of sterilizing amber samples, grinding them up, and then growing the ancient microbes found in it. The company’s research leads them to believe that these ancient microbes will yield more potent and powerful agricultural applications than modern-day descendants. They even isolated a yeast entombed in an ancient bee, grew it and found it very “active” as they brewed amber beer! The evidence suggests that biological deterioration and environmental degradation contributed to devolution (a decline in fitness, body mass, overall health, and longevity) through the ages.